The U.S. Navy’s future drone tanker has begun to break cover. In mid-August 2017, the first photos appeared depicting Northrop Grumman’s entry in the Navy’s Carrier-Based Aerial Refueling System, or CBARS — the years-long effort to produce the first drone warplane for the Navy’s carrier air wings. The photos, obtained by trade publication Aviation Week, depict one of Northrop’s X-47B jet-powered drone demonstrators U.S. Air Force’s secretive Plant 42 facility in Palmdale, California. The X-47B in the photos carries, under its 62-foot-span delta-shape wing, what appears to be a Cobham aerial-refueling pod. On the opposite side of the wing, there’s a drop tank for extra fuel. The underwing pod-and-tank configuration is not surprising. 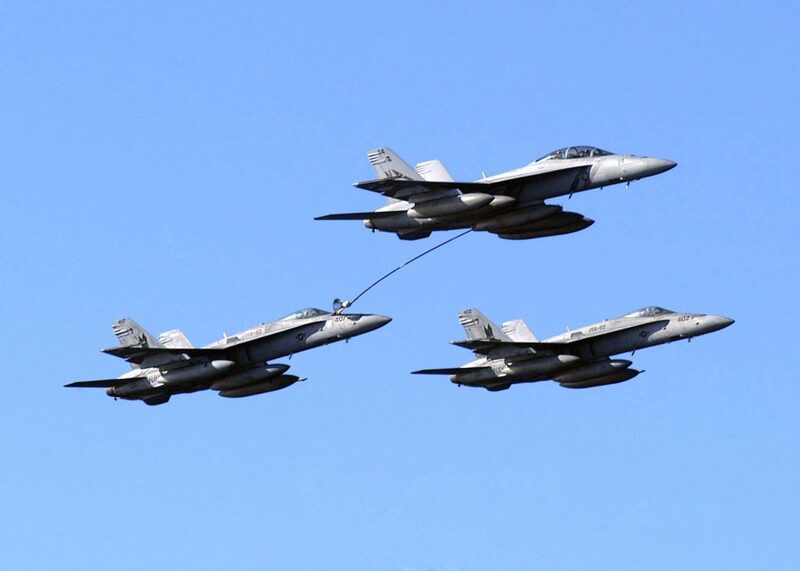 It’s the same arrangement that the Navy’s carrier air wings currently use for aerial refueling, albeit with F/A-18E/F Super Hornet manned strike fighters acting as the tankers. In the 1990s and early 2000s, S-3 anti-submarine planes had handled the carriers’ aerial refueling duties — again using the same pod and tank. The Navy specified the CBARS equipment suite in a draft request-for-proposals that the sailing branch sent to Northrop and competitors Lockheed Martin, Boeing and General Atomics in July 2017. For CBARS, General Atomics is proposing a variant of its Avenger drone, a few of which are in use with the U.S. Air Force and another, unspecified U.S. government agency. Boeing’s CBARS entry could be a version of the Phantom Ray, which is similar to the X-47B in size and layout. Lockheed’s design is an evolution of the company’s RQ-170 stealthy surveillance drone, currently in service with the Air Force. The CBARS program was previously known as Unmanned Carrier Launched Airborne Surveillance and Strike — and aimed to produce an armed surveillance drone for carrier air wings. UCLASS itself evolved from the Unmanned Combat Air System Demonstration initiative — UCAS-D — that ran from 2007 to 2015. As part of UCAS-D, in 2013 the two X-47Bs performed the first-ever carrier landings and launches by a large unmanned aerial vehicle, aboard the carrier USS George H.W. Bush. In 2016, the Pentagon directed the Navy to optimize the new UCLASS drone for the relatively straightforward aerial-tanking mission, and possibly add surveillance and strike capabilities later. That’s when the program’s name changed to CBARS. The Navy hopes that, in adding drone tankers to its carrier air wings, it will be able to relieve F/A-18s of their refueling duties, thus freeing up the fighters for combat missions. The Navy has estimated that as much as 30 percent of the Super Hornet fleet’s flight hours are devoted to tanking. The Navy plans to pick a winning CBARS design in 2018 and first deploy the new drone tankers with the carriers USS Dwight D. Eisenhower and Bush in 2019 or 2020. The Navy has assigned the new tanker-drone the name and designation MQ-25A Stingray.